The market topping process is volatile, but watch for high-momentum, overvalued stocks with negative expectations to lead the way down. A screen for these stocks returned a group of seven short candidates. 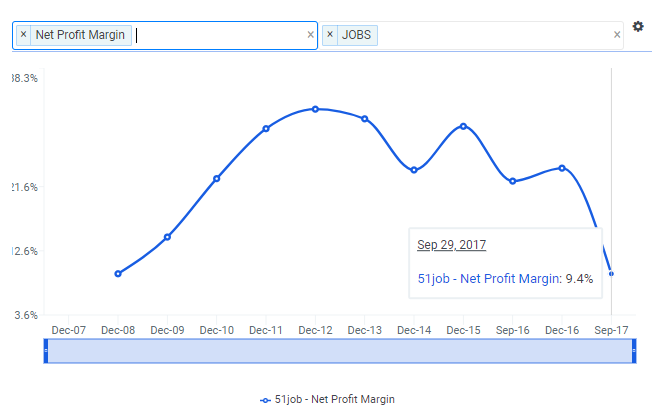 JOBS has the best resume of the group with a P/E of 149x, beta of 1.67, falling EPS and net margins, and a rising short ratio. Technicals do not indicate the stock is flagging yet. A conservative entry point is at the 50-day moving average, but it may pay to be more aggressive around $81.50 if growth-to-value relative strength confirms a rotation out of risk. The market topping process can be drawn out with major bouts of volatility. High-momentum stocks can be the first hit as investors lock in profits and roll into risk-off areas. This presents an interesting opportunity to bet against high-fliers, but where to begin? The process of identifying shorts is much easier today with online tools. 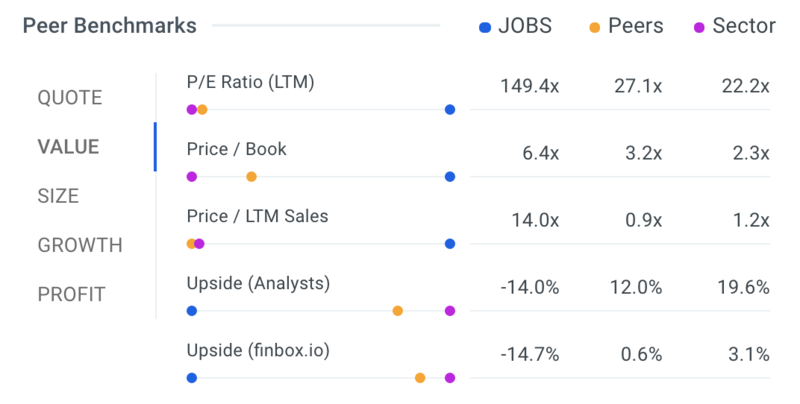 Finbox.io’s stock screener makes easy work of narrowing down the market to a handful of options. 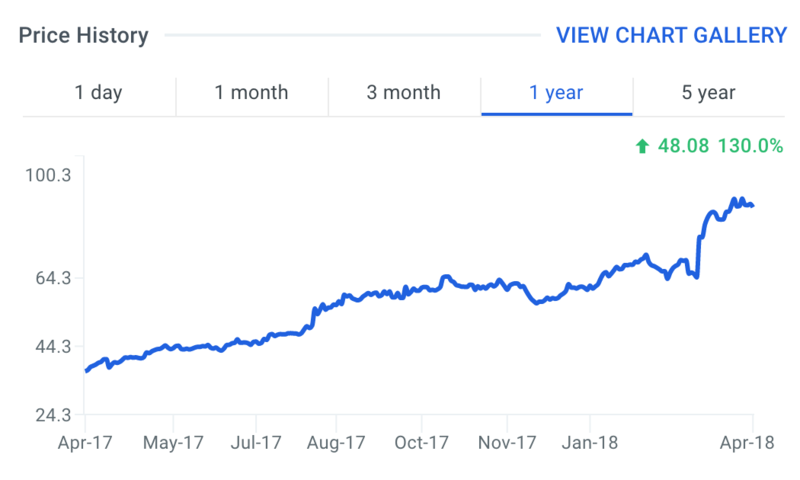 Setting the filters for at least $1 billion market cap, negative quant and analyst expectations (-10% price targets), and a 50%+ stock price gain over the last year returned seven stocks from a field of 6,000+. The results of the screen included 51job, Inc. (ADR) (Nasdaq: JOBS), Proto Labs Inc (NYSE: PRLB), Southern Copper Corp (NYSE: SCCO), Valhi, Inc. (NYSE: VHI), Virtu Financial Inc (Nasdaq: VIRT), General Cable Corporation (NYSE: BGC) and GCI Liberty Inc Class A (Nasdaq: GLIBA). A quick comparison of these “shortable seven” was then done by adding columns for P/E, Enterprise Value/Free Cash Flow, beta, and number of analysts covering the stock. Since Wall Street’s negative expectations are one of the main filters, it is important to ensure that more than a couple of analysts are covering the stock. The valuations metrics provide a quick check for stocks that may have gotten far ahead of their fiscal performance. 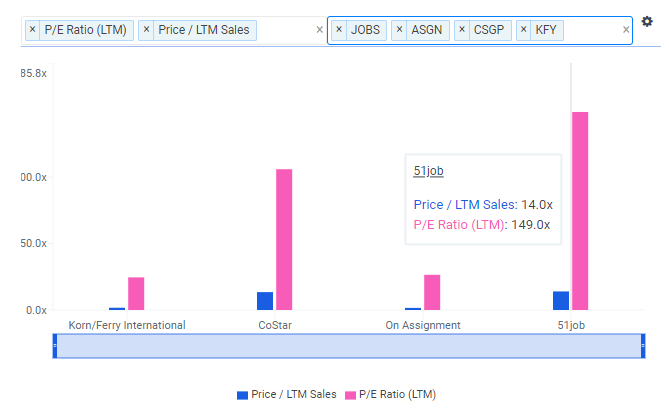 When using the Finbox.io screener, users can quickly jump to stock overview pages, which feature a handy Peer Comparison grid with tabs for value, growth, and profit metrics. This helps put some of the valuation metrics in context with their industry peers, and gives a view into management’s execution. 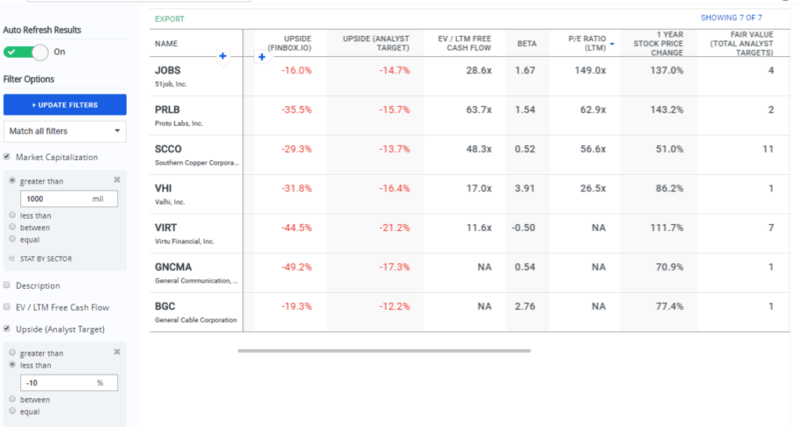 After throwing out stocks with few analysts, sorting for the highest P/E, and reviewing the peer benchmarks, Southern Copper and 51job stood out. Southern Copper had the highest EV/FCF multiple, and a copper miner will typically selloff with economic concerns. However, a look through SCCO’s last earnings release showed that the share float is nearly 90% owned by its parent company, Grupo Mexico. This makes it unlikely that SCCO will get hit hard. 51job is a China-based firm that provides job hunting and HR services within the country. Its beta is sky high, and it has a P/E that is 5x greater than its peers and sector. 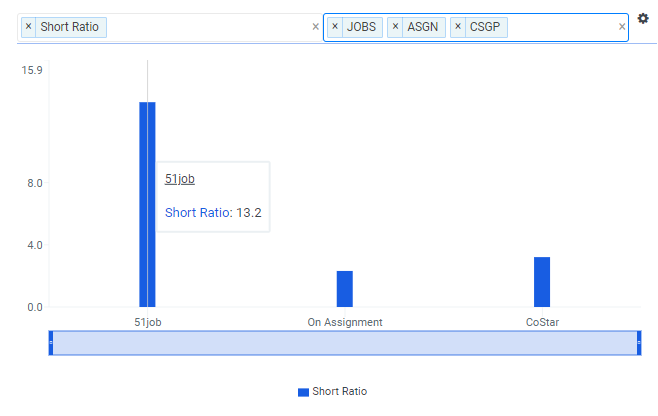 JOBS is an American Depository Receipt (“ADR”), matched 1:1 with its Chinese listing. 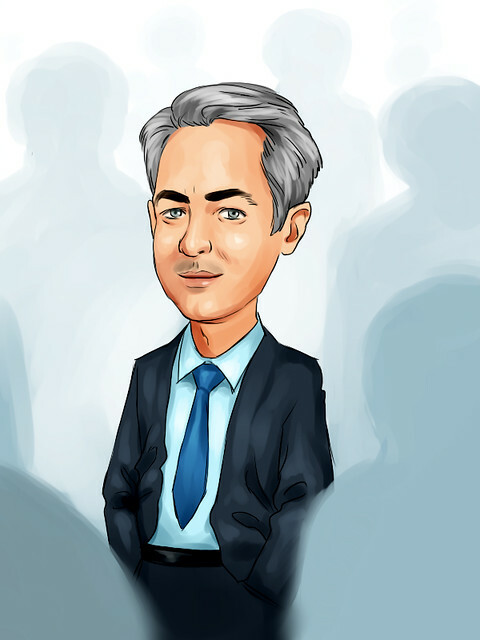 J.P. Morgan’s ADR.com indicates it is 95% owned by growth investors, and heavily held by emerging market funds. The stock is up 137% over the last year thanks to a risk-on investing environment, but its ownership and emerging market status mean it is very susceptible to market whims, which explains its beta of 1.67. 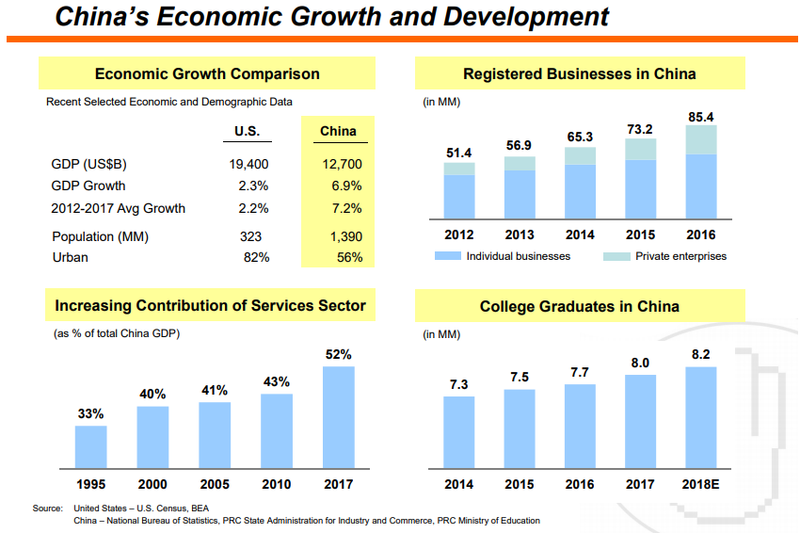 China’s growth story is well-known, and 51job's slide below provides a helpful review. China is working on transitioning to a service economy to lessen its reliance on developed economies, and has in place a trade policy that benefits it greatly by taking advantage of international companies that want access to China’s consumers. This is creating obvious tension between the U.S. and China with new U.S. tariffs and the resulting trade war headlines. Additionally, saber rattling over China’s island building in disputed waters of the South China Sea adds more tension. These ill winds have not had an obvious effect on the stock price, but add additional rationalization for avoiding China-based stocks when investors begin rationalizing risk. 51job derives 65% of its revenues from its job hunting websites. The slide below from JOBS’s Q4 call breaks down its product lines. Revenues are growing, and its has a strong position in a growing and transitioning economy. However, its financials do not reflect those of a high-flying tech company. 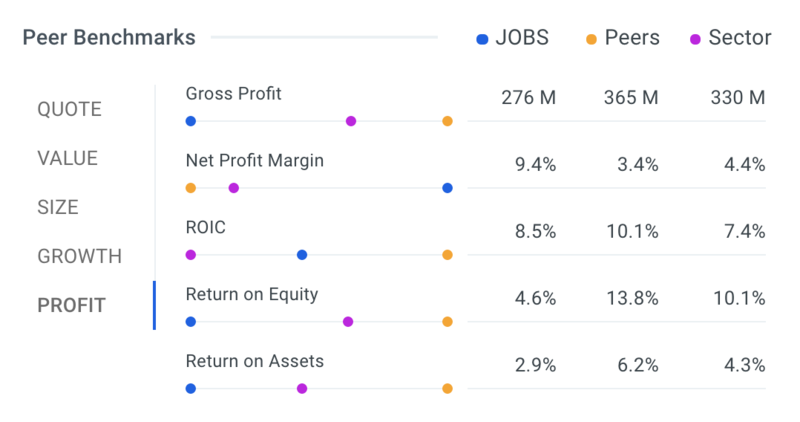 Profit and return metrics are a bit disappointing for an online company. Baidu Inc (ADR) (Nasdaq: BIDU), for example, another Chinese ADR and internet player, has net profit margins of 23.4% in contrast to JOBS’ 9.4%. Baidu also trades at a P/E of 30.6x, almost a quarter of JOBS. 51job’s return metrics are all in the single digits. It has been placed in the Industrials sector, as opposed to Tech, so its peer and industry comps should be easy hurdles. Earnings per share and profit margins are showing negative trends that the market, not analysts, is ignoring. With JOBS being lifted by the risk trade, it has not yet drawn individual attention from investors. Two of the major filters in the stock screen used to identify companies flying too high were quant and Wall Street expectations. Both see JOBS as overpriced, with price targets sitting more than 15% below current values. Confirming these negative outlooks, price multiples are also out of line with peers. Even outside of the industry, P/E’s are high relative to Chinese internet firms such as Baidu and Alibaba (BABA). Its Price/Sales ratio of 14.0x is nearly four times higher than NASDAQ’s 3.6x. JOBS’s short interest ratio is also very high compared to peers and the Chinese internet firms noted above. The 13.2 short interest ratio is two times higher than Alibaba (6.5) and eight times greater than Baidu (1.6). An old adage states that fundamentals tell us what stocks should be doing, while technicals tells us what they are doing. As long as the risk-on trend continues, JOBS will most likely continue to move up with the emerging markets group despite the negatives already noted. However, once the market moves away from risk, it is likely that JOBS would crash through the price targets. With this expectation, a conservative approach would be to short the stock when it crosses its 50-day moving average (blue line), which currently sits just above the price targets. A more aggressive entry point is around $81.50, where the stock found support after it jumped 29.8% between March 1 and March 9. 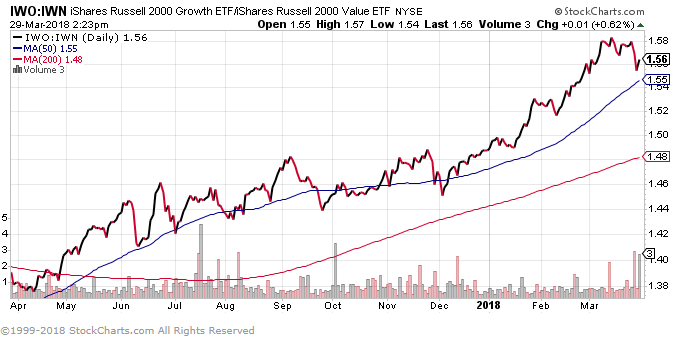 Another indicator to watch for weakening confidence is the relative strength of Russell 2000 Growth stocks to Value stocks. The relative strength line below uses ETFs to show that value has been outperforming growth during March volatility. A breakdown of the RS line will indicate that investors are de-risking. Lastly, watching the performance of the funds that hold JOBS can provide additional information. For example, Harding Loevner owns 14.2% of 51job’s float in its funds. HMLEX, its Institutional Emerging Markets fund, owns 4.1%. Rather than looking at this fund relative to a traditional benchmark index like MSCI’s All Country World Index Ex. 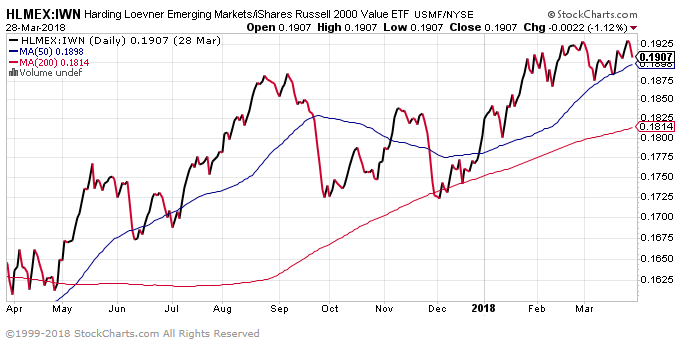 U.S., the chart below shows it against Russell 2000 Value to focus on measuring risk appetite. This ratio has found support at its 50-day moving average, and a drop below it could indicate trouble ahead. JOBS has had a great run over the last year, but it is outpacing its fundamentals. EPS and profits have been dropping, and price multiples are far above its peers and even more risky Chinese internet companies. Margin and return metrics indicate that management is not executing well, despite the positives of their industry. 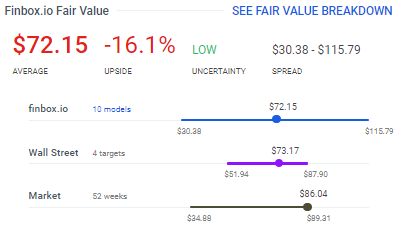 Both Wall Street analysts and Finbox.io’s quant valuation model see the stock as at least 15% overvalued. 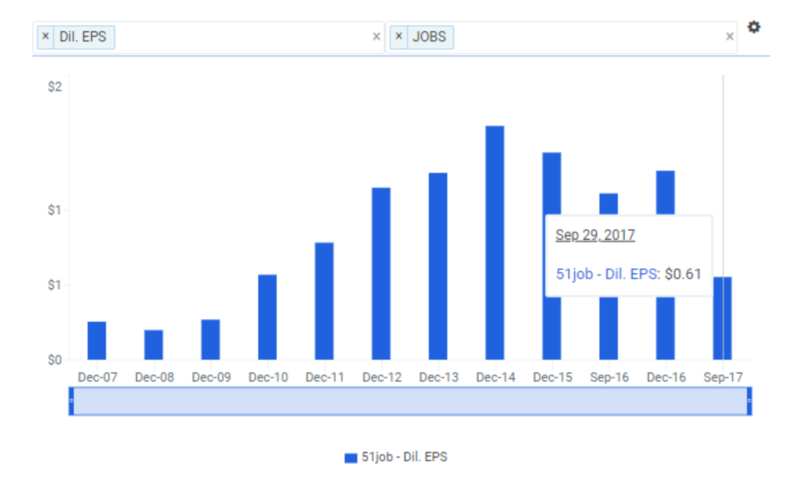 Adding to the negative potential is the fact that 51job is an emerging market stock, majority owned by growth investors. As the market peaks, its turn down will be led by risky high-momentum stocks, and emerging markets will be seen as trouble rather than a tool of diversification. Timing the fall is the hard part. Waiting for the stock to break below its 50-day moving average means that it will be back at fair value. However, fundamentals will be ignored in the carnage of topping, and JOBS will most likely easily break below the targets. Watch $81.50 as a more aggressive entry point, and use the relative strength of growth over value and stress in Harding Loevner funds for confirmation.